Effective volunteer management involves good communication and coordination of job duties. Like employees, it is important for volunteers to have a clear understanding of what is expected of them and given the training and tools to perform job tasks. A well-run volunteer program will include a streamlined process to recruit, place and train volunteers in a role that best matches their personality, interests and skill-set. A volunteer job description should be detailed enough to describe, not only job tasks, but also job hours and who to go to with questions. When writing a church volunteer job description, it is important to answer the following questions – who, what, where, when and how. Simply consider the job tasks that need to be performed, and ask these questions to determine the needed detail for the job description. Who does the volunteer report to? For example, who oversees ushers and who does the volunteer report to when scheduled to work? What tasks are the volunteer responsible for performing? For example, what does the usher do when he/she is on duty? Where does the job get performed? For example, where do ushers meet before, during and after church services and where do they hang their coats or purses while on duty. When is the shift the volunteer will be working? For example, when is the usher scheduled to work as part of the volunteer job schedule. How does the volunteer perform job responsibilities? For example, how does an usher dress, how do they communicate with guests, how do they take the offering, etc. Assist people with special needs, ie; wheelchair, stroller, etc. Ushers meet in the marked volunteer room behind the west hallway. Lockers and coat racks are available for personal items. Usher supplies, offering baskets, envelopes, umbrellas, first aid kit etc. are located in the marked closet on the north side of the volunteer room. Ushers are asked to wear suits for men and appropriate business attire for women. Volunteers should report for their shift at least 15 minutes ahead of time. Ushers are expected to represent the church in a positive way and demonstrate good customer service skills by being polite, patient, encouraging and engaging with the congregation and visitors. If an usher has a problem with a visitor or congregant, they should contact Elder Smith for assistance. Gather a few folks who understand what needs to be done, sit in a room with a laptop and just go down the list and answer the questions: who, what, where, when and how. 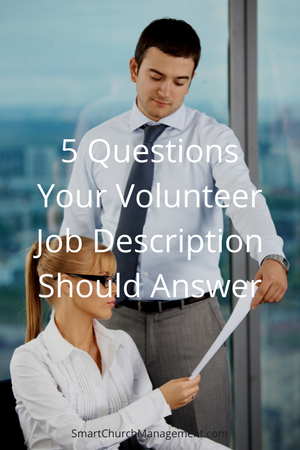 You will be surprised at how quickly you can create volunteer role descriptions. Lastly, church volunteers are free labor and a valuable asset. Take the time to develop systems and processes to support them. Investing some time thinking through and creating detailed job descriptions is one way to show your volunteers support and appreciation. Click here to access several common Church Volunteer Job Descriptions.